Norwalk Furniture franchise business opportunity. 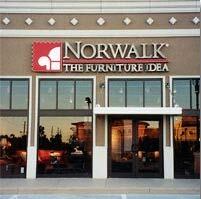 Free Norwalk Furniture business franchise information. For over 100 years, we've helped furniture shoppers create something unique. Since 1987, we've done the same for our franchises. Our philosophy is simple: Create stylish, one-of-a-kind upholstered furniture in an intimate, service oriented retail environment. That means a low-inventory investment for you and an extraordinary selection for your customers. It's this uncanny furniture store concept that makes our nearly 80 Norwalk - The Furniture Idea stores a growing success and the right concept, at the right time. Consumer research shows people spending more time at home these days. They see their home as their refuge, their sanctuary from the pressures of the world. More time at home results in more spending to decorate those homes. And today's sophisticated, upscale consumer does not want to settle for ordinary, off-the-shelf decorating solutions. If the need is for unique home furnishings, Norwalk - The Furniture Idea is the solution. Shoppers at our stores choose from hundreds of comfortable, fashion-right styles. We encourage them to cover those styles in their choice(s) of more than 1,000 stylish fabrics and leathers. Then, we invite them to personalize their selection through countless customization parameters. It's a unique concept that's backed by the insight and resources of Norwalk Furniture Corporation - a leader in home fashions. Talk about a good business marriage. On one side, you've got Norwalk Furniture Corporation, recognized industry-wide as the custom furniture manufacturer. 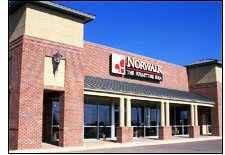 On the other, there's Norwalk - The Furniture Idea - one of North America's most successful custom furniture retailers. Together, they create a trusted and growing brand name. This unique partnership allows our franchisees and our consumers to get just what they want. From a business standpoint, what could be better than to offer the most choices while maintaining an absolute minimal inventory? That's what happens when you allow consumers their choice of what should be manufactured - instead of guessing consumer needs and amassing inventories to feed your sales. When you join the Norwalk - The Furniture Idea franchise family, you buy into more than just a brand name. You gain access to the support and insight that's helped our franchise network continually grow and thrive. It's a comprehensive support program that includes help at every stage of franchise ownership. Our on-staff real estate specialist has extensive franchise experience and will assist you in locating & negotiating a winning location for your store. Many of the franchisees we approve have no home furnishing retail experience. But our comprehensive and on-going training program is unmatched in the industry. An elaborate library of training videos and workbooks is supported by our retail training team, each of whom have several years' experience with our company. From the first week of operation, we provide a Norwalk specialist to assist you onsite to help ensure things go smoothly. That individual, as well as the entire franchise team, is available to answer your questions and to help with your business challenges from that day forward. Knowing what to buy and how to display it can be an overwhelming task for a furniture store owner. But assistance in these areas is provided by a team of Norwalk franchise professionals and through our comprehensive training program. In addition, our tremendous buying power is used to secure special shipping, distribution, and pricing for many products. From an extensive library of local newspaper advertising materials to direct mail and regional magazine advertisements, we provide it all, with most materials conveniently available online. A yearly marketing plan coordinates usage of these materials for maximum effect. To learn more about the Norwalk Furniture franchise opportunity, simply complete the form below.